Motorists involved in auto collisions commonly experience severe neck injuries including whiplash, especially when struck from behind. According to the American Academy of Orthopedic Surgeons, up to 40% of automobile accident injuries cause lifelong chronic, debilitating pain. There are more than three million cases of neck injuries every year in the United States, and three-fourths of those created symptoms that last six months or longer. Rosenfeld Injury Lawyers LLC represents victims of vehicle accidents and other types of professional negligence. Our law firm has successfully prosecuted cases for our clients who were in a car crash and suffered harm. Our attorneys are available to answer any legal questions on how to receive the monetary compensation you deserve if your injuries were a result of someone else's negligence. Should you have additional questions, we invite you to contact our office for a free review of your legal rights. The human neck is constructed of complex, delicate bones, the larynx, tissue, blood vessels, and other vital parts that connect the brain to the body and transmits back-and-forth signals through the body's spinal column. Any sudden impact caused by a crash or accident can cause significant harm to the neck, especially if it is flung forward during impact. 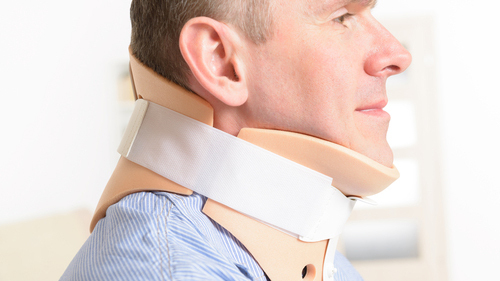 Some doctors diagnose every neck injury as whiplash. However, this condition is caused by specific injury to the neck and cervical vertebrae. Individuals with pre-existing medical conditions including arthritis are at a higher risk of experiencing greater pain and injury severity. The force of the collision can cause bones to break in and around the neck including on the face, extremities, and collarbone. The impact can also cause the spinal column to shift out of place and cause bulging, herniated, ruptured or slipped discs that result in excruciating pain. Other musculoskeletal injuries including lower back pain can result from an accident caused by damage to soft tissue, vertebrae, discs, and spinal joints. The spinal column is made up of facet joints that play a crucial role in the spine's function. A flexible, thick membrane surrounding the joints secrete viscous fluids that provide lubrication and allow the spine to move with ease. The joint provides body weight support and facilitates spinal movement between the vertebrae. The joints work with spinal discs to provide controlled, strong movement throughout the body. When the facet joint is injured, the individual may experience strong muscle spasms when bending or stretching. The injured joint may become “frozen” and cause it to slip from its normal place. Many doctors will confuse a facet joint injury with a spinal disk injury because many of the associated symptoms are the same. The patient may experience a sudden painful attack caused by an aggravated or irritated nerve inside the joint. The doctor may recommend treating the pain associated with a damaged facet joint with a hot or cold compress applied to the affected area for 15 minutes every 2 to 3 hours. Taking ibuprofen or other NSAID (nonsteroidal anti-inflammatory drug) could help alleviate the pain and reduce the swelling in the neck and shoulders. Some studies show that traveling at less than five mph can cause a neck (cervical) injury. A 1990 study released by the National Highway Traffic Safety Administration (NHTSA) revealed that approximately 30% of all motor vehicle occupants suffered severe to fatal injuries when in a minor or moderate accident. An emergency room doctor or orthopedic surgeon will diagnose whiplash and other neck injuries through x-rays that can reveal minor to severe damage to the cervical spine. However, other imaging tools including CT scans and MRIs (magnetic resonance imaging) might be required to reveal the injury to soft tissue including ligaments, muscles, and tendons. The doctor will ask if you have severe neck pain, stiffness in the neck, or tingling, pain, and numbness in the legs, arms, or shoulders. You will likely be asked if you have had any issues with your bowels or bladder, or localized weakness in the legs or arms. These symptoms along with a sharp, shooting, or dull pain are indicators of an acute whiplash injury. Any individual who has suffered a severe neck injury caused by a vehicle accident should seek immediate care from a qualified professional. A doctor might prescribe pain relief drugs including naproxen, ibuprofen, or aspirin and recommend gentle exercise, massage, traction, physical therapy, ice, and heat to allow damage to soft tissue to heal. In addition to receiving medical attention, chiropractic care can give significant relief of pain and discomfort in the neck through chiropractic adjustment or manipulation. Additionally, the doctor will likely recommend the injured victim perform various exercises to minimize discomfort and allow the injured neck to heal. These exercises could include sensorimotor exercises, stabilization, and McKenzie exercises that are effective at treating the sudden onset of sciatica or acute lower back pain. Muscle relaxation medications and muscle stimulation can also improve major discomfort in the neck and shoulders in the weeks and months following the accident. In some cases, patients suffering from acute and chronic nerve injuries find relief through electronic nerve stimulation by using a device that provides a gentle electric current that can diminish neck pain. Other patients have found pain relief through acupuncture. A report released by the National Institute of Neurological Disorders and Stroke reveals that most accident victims will fully recover in the first three or four months after the collision. However, in the years after an automobile accident, some victims experience unexpected headaches or chronic pain for the first time since the crash. To diagnose the problem, the doctor might find the source of the pain by recognizing damaged ligaments, discs, and neck joints. In rare cases, there is no medical explanation as to why the neck hurts. The vehicle accident attorneys at Rosenfeld Injury Lawyers LLC understand the impact of suffering a horrific injury in a vehicle accident that was not your fault. We have successfully obtained millions on behalf of the victims and their family members to ensure they were adequately compensated to cover their medical expenses, household bills, lost wages, loss of future earnings, pain, suffering, and emotional damage and we can help your family too. We will build your case after conducting a comprehensive investigation into the accident and your injuries, and explore every available source of compensation. Our investigators will figure out how the other driver caused your injuries and seek compensation through their insurance liability coverage. In addition, we will seek out other defendants in your case that might also be responsible for your injuries to ensure you receive the maximum monetary recovery available. Our team encourages you to contact our attorneys today to schedule a free, no-obligation case consultation to discuss the merits of your monetary recovery claim. We accept all personal injury cases, wrongful death lawsuits, and accident injury claims through contingency fee arrangements. This legal contract postpones the payment of legal services until after we have successfully completed your case through a negotiated settlement or a jury verdict.